The kola nut is a caffeine-containing nut of evergreen trees of the genus Cola, primarily of the species Cola acuminata and Cola nitida. Cola acuminata, an evergreen tree about 20 metres in height, has long, ovoid leaves pointed at both the ends with a leathery texture. The trees have yellow flowers with purple spots, and star-shaped fruit. 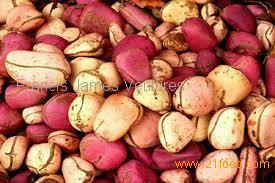 Inside the fruit, about a dozen round or square seeds develop in a white seed-shell. 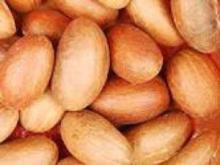 The nut’s aroma is sweet and rose-like. The first taste is bitter, but it sweetens upon chewing. The nut can be boiled to extract the cola. This tree reaches 25 meters in height and is propagated through seeds. C. nitida and C. acuminata can easily be interchanged with other Cola species. 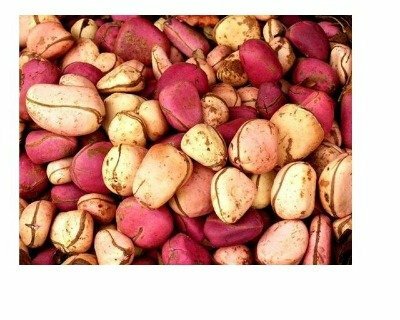 Kola nuts comprise about 2% caffeine, as well as containing kolanin and theobromine. All three chemicals function as stimulants.